Tablets Encourage Active Learning Don't They? There's a lot of discussion in the media that suggests that using a tablet is a passive experience for kids and being used as a digital babysitter and making them anti-social. A lot of the recent discussion followed on from this NY Times blog post. For my kids tech use is a very interactive and social experience and I love the way tablets and PCs enable their independent learning. There seems to be a perception of young kids sitting in a corner mesmerized by the screen. That's just not how my kids interact with technology on a day to day basis. Either this perception is wrong or the kids being observed are different to my kids and their friends and cousins. I've been wondering why there's so much concern that I just don't have with my own kids. Part of it is obviously because worrying parents generates media interest, but a recent study indicates a connection to the age of parents. CNN reports on a recent study that modern parents of young kids aren't concerned about their use of technology. Image: My nephew shows me the Scratch programming that he's been doing. I've talked before about the technology that I grew up with, I guess I'm from one of the first generation of parents that grew up with a reasonable amount of access to tech. Parents who started their families at a younger age will have had a lot more technology around them. It makes sense that we're starting to see less concern around technology usage because there's more understanding of what it means and how to deal with concerns. Are the people voicing concerns talking about kids just watching regular TV shows and movies on tablets and not doing anything interactive? This is one of the things my kids spend the least time doing. Watching longer shows on the tablet is just a very occasional activity in our house. My kids do watch videos on YouTube but they are typically a few minutes long and involve searching to find the right thing. I love it when my younger son is calling 'how do I spell ...' from the computer so he can find something really specific that he wants to see. My six year old uses YouTube for research into topics he's interested in - he likes history and animals. His current favorite topic is the woolly mammoth and I love that he doesn't have to wait for a trip to the library or a relevant program to come on TV as I would have as a child. Recently my younger son went to a friend's house for tea. They did lots of things including running around in the garden. 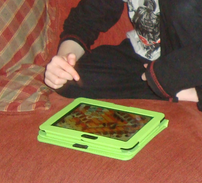 They also spent a bit of time playing Angry Birds Star Wars on the iPad. They took turns and discussed strategies. Then he came home and played Angry Birds with his brother, taking turns and laughing a lot. This kind of tablet use is very common with kids and very social. App knowledge is social currency these days. We spent some time with family recently and the cousins spent a lot of time sharing their gadgets. They would do things together or swap devices to try an app that someone else had. There was lots of discussion and interaction. (In the image my son is trying out an app on his cousin's tablet.) Don't worry they spent plenty of time in the garden and doing outdoor activities too! There was lots of adult-child interaction as well. I spent time helping my 8 year old nephew get some things set up on his Kindle Fire (we have one too), not that he needed much help, he's a very fast learner! Then there are all the educational and edutainment type apps. An app that gives you feedback and can offer a choice of difficulty levels and hints offers so much more than a passive printed worksheet. One of the reasons I think tablets in particular are good at promoting independent learning is that they are inexpensive enough that many kids have their own device. 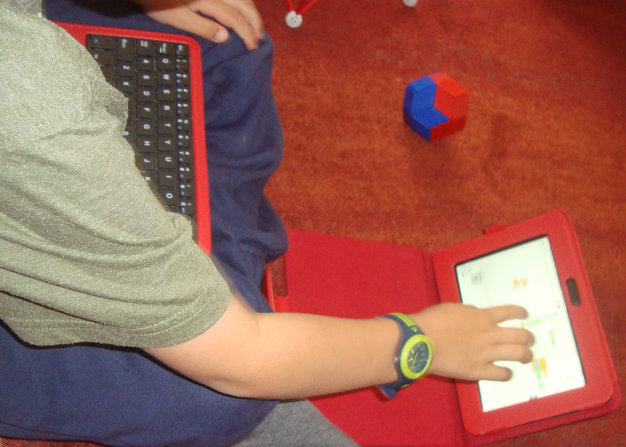 This gives them a sense of ownership and control over the device which encourages them to try things out. With my kids, the more input they get, the more they build on it with their own imagination. Their role play is full of characters from Greek mythology mixed up with Narnia and characters from their favorite LEGO themes and apps. If there are lots of kids out there who are using tablets in a passive way which is not encouraging independent thinking or real-world social interaction then I don't think the answer is for them to use tablets less - clearly they're engaged with the format, but to try and steer them towards more interactive content and opportunities to engage with others with similar interests. I know there's still work to be done on parental controls and online safety and we've got to make sure kids get plenty of physical activity and learn to entertain themselves too, but I'd like to see more focus on the amazing advantages that access to tech is giving our kids.